The recently constructed RESIDENCE BAIA DI SORGETO, is situated amongst the lush green vineyards of Forio in Ischia. 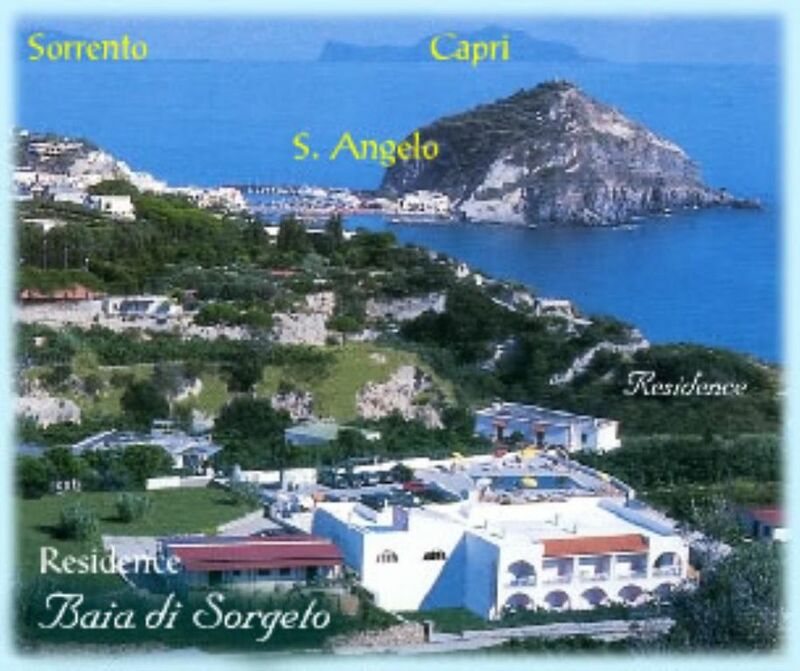 It is conveniently located 2 km from Poseidon Gardens, 1'5 km from Sant'Angelo, 800 m from the centre of the village of Panza, and just a small walk away from winding steps down to the Baia di Sorgeto (Bay of Sorgeto). The peace, the aromatic smells of the surronding vegetation, the closeness to the sea and the unforgettable view of Sant'Angelo and Capri (in sight from the large pool terrace of 350 mq), makes the Residence an ideal place for total relaxion. The Residence's private thermal pool is rich in minerals (13 m x 8 m and 32°C) taken directly from the springs below (80°C and 105 m deep), which possess therapeutic properties, toning muscles and stimulating the skin. The accommodation was simple, clean and well-cared for. It is very much as it looks in the publicity material. Pepino and Claudia were extremely welcoming, friendly and helpful in every way. The residence is walking distance to the village of Panza, with direct bus links to Forio and St Angelo - and even shorter walking distance to Sorgheto Bay, where it’s possible to get a taxi boat to St Angelo and on to the beaches of Fumarole and Maronti. One of the local shops in Panza will deliver your groceries (not the Carrefour, the other one!) and when I initially stopped en route to the residence to do my shopping and asked them if they delivered, they also very kindly gave me a lift too, with my luggage! This was my second visit to the residence, because my first visit had been so good. I spent all my daytimes at the beach this time, so didn’t use the thermal pool, though last visit i did acclimatize there for a day or so first. The pool is fine, though i prefer the sea! This place is really well-situated and in a beautiful part of the world. I recommend it highly. Owner speaks three languages apart from the native one (Italian): English, French and German, which is unusual for this area and great advantage. Besides his profession was hotel manager, maybe that's why all is properly organised. He is always friendly and is ready to help you with any questions you need concerning your accomodation or whatsoever in Ischia. There is enough space for parking, two swimming pools with thermal water. Apartments are located a bit far from the main street therefore there is peaceful and quiet. We would recommend these apartments for having your vacations. Yegor and Alyona di San Pietroburgo"
"Very nice place and friendly owners. The Ischia itself is interesting place for vacation and if you like good food and wines ( directly from producers ) it is for you." The accomodation was clean and comfortable. The cooking facilities are basic but there is also a wonderful wood-fired oven and barbecue available by the pool. We stayed in a ground floor apartment and sat on the patio by the tranquil gardens for every meal. The singing of the birds and fragrence from the garden made every day wonderful. The owners were very helpful and the outdoor ansd indoor thermal pools were really lovely. A fantastically relaxing holiday - there were plenty of villages, beaches and woods to explore too. Très beau cadre au calme avec petite piscine intérieure et grande piscine extérieure à l'eau chaude thermale. L'idéal pour se détendre et visiter l'île d'Ischia. Les propriétaires sont charmants et sont une source intarissable de bons conseils sur les visites ou bons coins où se restaurer. The island of Ischia is reachable by ferry-boat or hydrfoil leaving from Naples: Beverello-Mergellina or Pozzuoli. Local supermarket purchases may be delivered to the apartment free-of-charge.Transfer to and from Naples airport or from the railway station to the Residence can be arranged.